The Routledge Encyclopedia of Citizen Media sets out to chart the territory of citizen media, a new, fast evolving disciplinary terrain. Citizen media is understood in the context of this project as the physical artefacts, digital content, performative interventions, practices and discursive formations of affective sociality that ordinary citizens produce as they participate in public life to effect aesthetic or socio-political change. Pursuing an inclusive agenda, this understanding of citizen media encompasses such diverse forms of political and aesthetic intervention in public life as graffiti and other forms of street art, street performance, community theatre, rap and hip hop, community radio, citizen journalism, citizen photography, blogging, tweeting, documentary film making, hacktivism, fansubbing, and scanlation. As such it allows engagement with participatory cultures across the entire spectrum of a population, irrespective of their level of access to digital media. create a practical and unique resource in one accessible volume that can be adopted for a variety of university courses; help the field of citizen media gain ground in higher education settings; is not submerged in and confused with many other reference works on different aspects of media studies that are already available on the market. More information on the progress of this project will be posted here over during the production process, until the publication of the Encyclopedia. 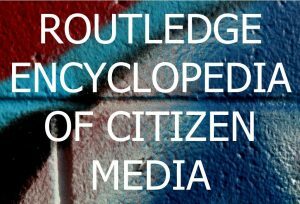 If you have any queries on The Routledge Encyclopedia of Citizen Media, please e-mail one of the editors.